If you conduct even the briefest of Internet searches, you will discover all sorts of blogs, newspapers and magazines recommending wines for Thanksgiving. I’ve seen articles recommending Beaujolais (ideally Cru) and rosé Cava, for example, both of which sound lovely and not nearly alcoholic enough for a major family holiday. I decided it was time to dust off my mixologist cap. A pumpkin or pumpkin pie martini sounded too much like dessert, and neither turkey, gravy, stuffing, nor green bean casserole offered a flavor profile I wanted to recreate in a drink. That left cranberry sauce. Since I’d never worked with 100% unadulterated cranberry juice, as distinct from the cranberry juice cocktail used in Cosmopolitans and Cape Cods, it seemed like a fun challenge to use it as my inspiration. Because 100% cranberry juice tastes extremely tart, it requires some sweeter ingredients for balance. I tried mixing two parts bourbon and one part cranberry, but the bourbon couldn’t begin to balance out the cranberry on its own. Simple syrup seemed like a cop-out; why not just use cranberry juice cocktail? Then I remembered when an old roommate of mine decided to make cranberry sauce for my family’s Thanksgiving dinner. Wanting to be sure to cook enough for the ten of us, he filled an entire stockpot with the stuff! Fortunately it tasted delicious, with orange zest adding an extra layer of sweetness and flavor. Fresh-squeezed orange juice could be just the thing for this cocktail — juicy and sweet, but not too sweet. But even with two parts bourbon, one part cranberry and one part fresh-squeezed Valencia orange juice, the cocktail didn’t sing. The flavors were all too high; I needed some low notes to feel satisfied. Some Angostura Bitters did the trick. Four dashes, and the cocktail tasted well-rounded at last. I had a quick look around to see if anyone else had stumbled upon this concoction. 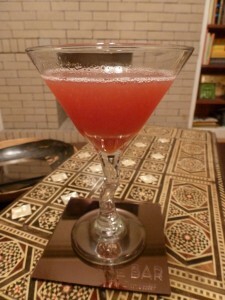 Cocktail chronicler Eric Felten came close when he described the Bardstown Sling, a drink of bourbon, triple sec, cranberry juice cocktail and lime, which is essentially a Cosmopolitan with bourbon instead of vodka. The blog Cold Glass gets even closer, substituting 100% cranberry juice and Cointreau for Felten’s cranberry juice cocktail and triple sec. To get the proportions right, squeeze half an orange first and use the amount of juice you recover as the measure of one part. The juice of half a small orange should be about right for one cocktail. Combine all the ingredients and shake with ice. Strain into a martini glass, and if you must, garnish with an orange slice or a few fresh cranberries. Don’t be fooled by the beautiful deep pink color of this cocktail. It’s quite strong and tart, but the dash of bitters keeps its feet on the ground. Love the name! We all need a little “helper” getting through family gatherings. The Unusual And The Obscure — On Video Is This Beaujolais? No, It’s Iowa.